Anyone have a clue on this? Ok, so the first answer on this page helped me greatly when I was trying to figure this problem out myself, although as someone else already stated, if you have a line width greater than 1px you get funny shapes. The fix that someone else suggested almost worked, but I still had some issues when trying to go for a thicker width arrow. After several hours of playing around with it I was able to combine the above solution with some of my own tinkering to come up with the following code that will draw an arrow at whatever thickness you desire without distorting the arrow shape. This is now the code that I am using in my program. What I found to be the key with eliminating the distortion issue was continuing the stroke from the tip of the arrow to one side point, to the other side point, back to the tip, and back over to the first side point, then doing a fill. This corrected the shape of the arrow. And here is a demonstration of it to draw arrows at the start and at the end of a line. 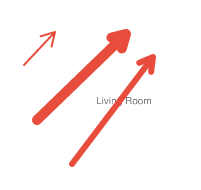 Given a size and the starting position, following code will draw the arrow for you. this.w = 100; // default width and height? You can push your matrix, rotate it, draw your arrow and then pop the matrix. My main problem was drawing nicely looking arrow heads, which jCanvas does perfectly. For my c# project i reverse engineered the jCanvas code. Create equilateral triangle in the middle of canvas? How to draw arrow in HTML table across cells? Why is setTimeout(fn, 0) sometimes useful?